Mango Bay is an elegant mansion ideal for holidaymakers seeking an unforgettable getaway. Located in the luxurious Parish of St James. Mango Bay is an elegant mansion ideal for holidaymakers seeking an unforgettable getaway. Located in the luxurious Parish of St James, this holiday villa is a magnificent home to appreciate the best of Barbados from. The villa's bedrooms are wonderfully decorated with beautiful and delicate prints. The designer of the home has made sure to fill every little part of the room with divine intricate details. These charming rooms will make you feel right at home with large windows and doors offering a dazzling natural light. The indoor dining room sits adjacent to the pool which can be seen through the room's floor-length doors. This room is perfect for special events and entertaining friends and family at dinner parties. Outside, the patio exudes elegance. The area possesses a tasteful chandelier that hangs from the ceiling, stylish white furniture and is beautifully adorned with plants and flowers. The patio benefits from curtains draping down to the floor offering complete privacy. They can be opened when you wish to take in the glorious surrounding views and sunshine. And you'll have plenty of gorgeous scenery to admire. The garden is completed with artistic contemporary sculptures, bright pink flowers that adorn hedges, and towering palm trees. Best of all, you'll be able to utilise the huge private outdoor pool and swim under the stars! When you tire of the private pool, head down to the marvellous beach. It's right on your doorstep! 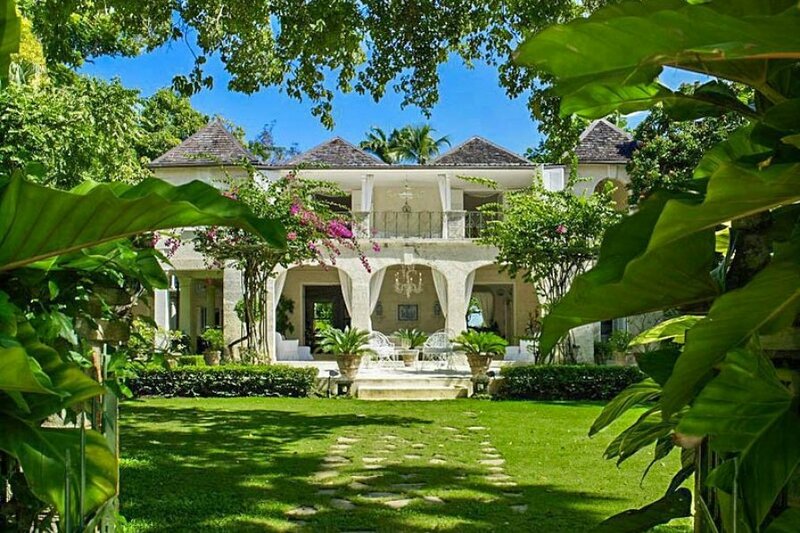 Mango Bay has a reputation for being one of the most beautiful residences in Barbados. Having been recently restored with natural coral stone, this charming 7-bedroom villa is incredibly lavish. Mango Bay is situated exactly in between the Bajan towns of Holetown and Speightstown. Golf pros and enthusiasts will be happy to discover that the villa is located just a short drive away from three world-renowned golf courses; Sandy Lane, Royal Westmoreland and Apes Hill. For guests looking for a place to party, Red Door Lounge in Holetown is the undisputed place to go. Open from Thursday night to Saturday, Red Door boasts a lively and friendly atmosphere complemented by the luxurious and stylish decor. Although it is the go-to spot on Saturday night, Red Door still has an easy-going ambience. Visitors to the venue can order one of the unique and tantalising cocktails, take a seat and enjoy the party! Get down early as this popular spot gets extremely packed quickly. Holetown beach is a great choice for a nearby beach as it's located on the glitzy west coast of Barbados. Located just behind the post office and police station, this quiet slice of paradise provides the keys to endless tranquillity. As it's a small beach, visitors are best bringing their own picnics and beverages for a day out enjoying the simplicity of the sun, sand and sea. Sunsets and sunrises are irresistible here. Why not take in the local scenery while gliding across the sparkling waters on a boat trip? You'll even be able to try your hand at spotting some of the plethoras of tiny fish species' in the sea. Zaccios bar and restaurant is situated next to this beach and provides a wonderful venue to retreat to after a day spent in the sand. The restaurant serves a range of cuisines for meat eaters, vegetarians and vegans alike. While here, try the fresh catch of the day, coconut shrimp or pizza, all washed down with a glass of authentic Caribbean rum punch.